Very good food. Nice salad and soup bar. FRIENDLY! great food! great service! Thank you! Great holiday buffet, reasonably priced and serves till 9 p.m.
Great food and excellent service!!! A must!!! Great St Patty's Day buffet have also eaten there for Mother's Day and Easter and it was wonderful. Very reasonably priced and they serve until 9 p.m.
Food is good but way overpriced. I only go here when the other people in my group want to go. The bartender was awesome. His name is Dillon. Best damn place in town!!!! Good place for friends to gather. Wait staff is always fast and friendly. Fair price, but people at the bar do not consider it is a family environment and the language is often vulgar and crude. Yes it is a bar, but people should be aware of those around. Great food and fast, friendly service! The cook is great. The flavor of the food, it's so hot and fresh . What more can you ask for. All the different sauce selections of wings . And then the drinks .You ask for it and you get it. Ask for chocolate and you get a chocolate drink with a Carmel drizzle. They make you feel at home. Great! It says I have to have 25 characters to leave a review so there you go! Burger dip is Louisiana approved!! Delicious!! We had a small group to eat and visit early afternoon. Service was fast, food was great and it didn't matter how lone we stayed. It's a great place. Had a great burger, service was good, unfortunately I was there at the end of the lunch shift, so we had some loss in service. Food is great, the prime rib seafood buffet was fantastic! 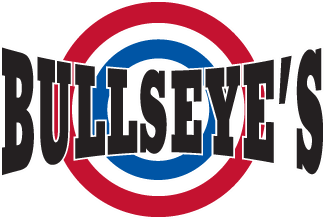 Need relaxation after “a day of it” at work, then Bullseye is the place! Great food, great service. Great place to eat. The food is amazing and the waitresses are so sweet!! This was even the first place I went for my first shot after my husband and I got married!! Great food! Service can be slow at times but the food makes up for it! Plenty of Tv's if you are looking for a place to watch the game while you eat. Not your typical bar food. Most menu items are made in house. Outstanding wings and appetizers. Loved the Loaded Fiesta Fries and Sparky’s Wings. Service was superb, great waitstaff. Great Taco Salad & service!! Great service, good staff, good atmosphere but a little crowded sometimes. Wonderful seafood buffet. Busy but still received good service. Large portions. Good food. Soda was under carbonated so I would order tea next time. The food was delicious, hot, and more than we could eat at one setting. Will make this a regular eating place from now on. Nice comfortable place. When I don’t feel like cooking after work and I want to just chill out and relax, this is the place for me.